Wednesday, December 2nd, the Montana Kaimin put out its last issue for fall 2015. For the all-student staff, it was the culmination of a semester of learning on the job as they guided the newspaper through its recent transition from a daily paper into a weekly print edition with daily online present, all while facing financial issues from years prior. 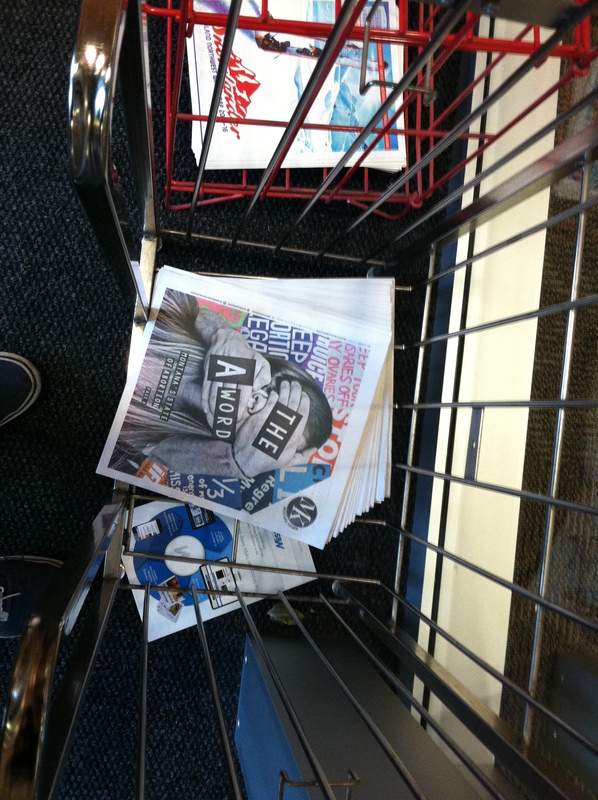 The Montana Kaimin’s last issue for the fall semester went quickly off the rack. Photo by Andrew Graham. “For drastically restructuring something that was essentially broken I think it went really well,” said editor-in-chief Cavan Williams. He led the paper into its new format, which meant establishing a new workflow from reporters and photographers through editors and the copy team. “The whole thing was just an experiment,” Williams said, and they’ll carry on making adjustments and applying what they’ve learned to production this coming spring. That the fall went well isn’t to be confused with perfect, he noted. The weekly edition implied more time for reporters to report and write feature length stories. Some of them, Williams said, have really taken to the long form style. Tess Haas, a 22 year old senior from Bozeman, Montana, has worked as an arts and culture reporter for the last two semesters. She wrote two features that ran as cover stories this fall. The first was about Montana female DJs overcoming sexism in their profession, and the second, which ran in Wednesday’s final issue, was about the dearth of information and clinics for women seeking abortions in Montana. “For people who are trying to be creative in presenting these important issues it’s really awesome to see them have the space to do it,” she said of the weekly format. Haas revels in the new style, which she says she’s used to expand on the ideas she had last spring, but couldn’t accomplish under tight daily deadlines. Her latest story was inspired by listening to a friend talk about the difficulties of getting an abortion in Montana. The issue aroused her passion as a young female journalist. “As a young woman in Montana I think it’s extremely relative to me, and that’s what my friends talk about and that’s what I want to write about,” Haas said. She spent a month working on the story, and says one of the challenges was finding sources that would speak about a sensitive topic. The article centered around the story of an anonymous woman who had an abortion following her first semester at the University of Montana. Having her editors allow her a month to work the story made all the difference. Haas will rejoin the Kaimin staff for the spring semester, her last at UM, but this time around will work as the Arts and Culture editor. Pauli writes op-eds for the paper, and the one he is most proud of this semester listed a litany of critiques of University administration under the wry headline ‘Recent scandals this editorial is not about.’ His favorite weekly issue of the semester featured the story ‘Left Behind’ by news editor Erin Loranger, which profiled the Office of Residence Life’s ill fated attempt at establishing a Living Learning Community for veterans. In general, Pauli is proud of his newspaper’s watchdog role over the University. “We’ve completely led the way on stories for the enrollment and budget crisis,” he said, adding that local newspapers like the Missoulian and the Missoula Independent have often followed Kaimin reporting. By mid morning on Wednesday the last issue was already down to the bottom of the racks in the School of Journalism, but next semester students across campus can look forward to the return of the Kaimin’s independent and in-depth journalism. You can read Tess Haas’ feature length story on abortion in Montana here. Read the editorial Hunter Pauli is most proud of here.